From the pioneer days in barracks to the Pope in the Vatican, from the first mathematical equations to cutting edge computer simulations – for three decades, the physicist, political advisor and Climate-KIC chairman Hans Joachim Schellnhuber has been exploring climate change as a challenge for humanity. Account of the state of research, life story, eco-manifest: all this is his major upcoming book on the climate crisis. As the founder and director of the Potsdam Institute for Climate Impact Research (PIK), he authored hundreds of scientific papers and shaped ideas like the internationally-accepted two-degree limit. A few weeks prior to the UN Climate Summit in Paris, his book now addresses a wider public. The book is available in German and can be ordered in print or as an e-book. “The title ‘self-combustion’ is a double provocation”, explains Schellnhuber. “Indeed, humanity is on the way to unintended self-combustion, if we do not immediately turn to the path of sustainability.” If we keep on burning coal, oil, and gas unabated, the released greenhouse gases will heat our planet by about four degrees Celsius until the end of the century – later by six, by eight degrees. 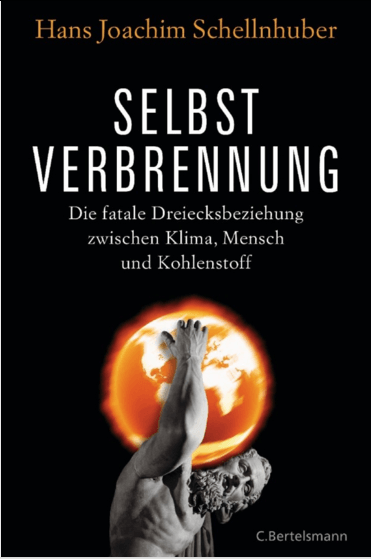 At the same time, the title „self-combustion“ alludes to the fact that the scientist Schellnhuber now exposes himself to the fire of the public conflict as a book author, as he did before as a public speaker and as an advisor of institutions like the German Federal Government or the World Bank. “For sure, my life would be easier if I would just accumulate studies over studies”, says Schellnhuber. So in all respects, Schellnhuber’s book is extraordinary. Framed very personally – beginning with a story about his mother, ending with one about his son – it forges a long bridge from the history of climate science to climate summits like COP 21 coming up in December in Paris, where 40.000 attendants from 190 countries are being expected, to the climate future of rich and poor. This is why John Schellnhuber doesn't have time for Twitter: he just published the 784-page epos 'Self-immolation': https://t.co/YtKkVG96kQ. Hildegard Müller, Chair of the General Management Board of the Federal Association of the German Energy and Water Industry (BDEW): “Hans Joachim Schellnhuber asks wise and partly painful questions. Peter Höppe, Head of Munich Re’s Geo Risks Research/Corporate Climate Centre: “Self-combustion’ is the book of one of the internationally most renowned climate scientist, that is written with lots of personal commitment. There is probably no other book that depicts the physical processes and political discussions about climate change as comprehensively and understandably as this one.